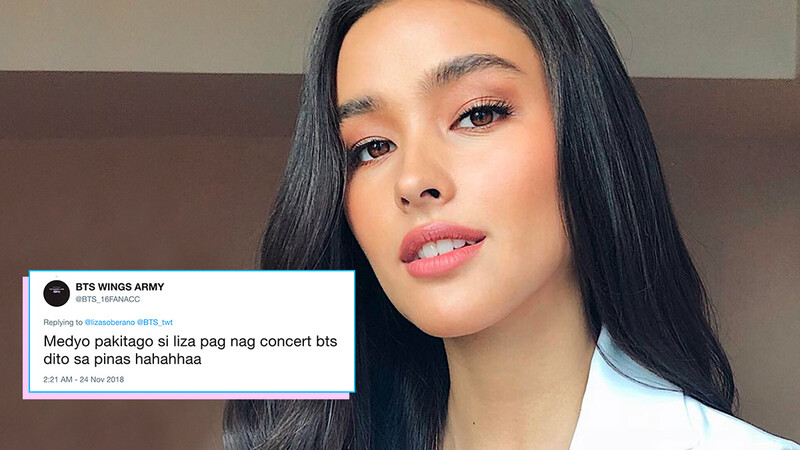 Liza Soberano Fangirling Over BTS Is So Relatable! Liza Soberano, who's set to star in the upcoming Darna remake and in an Antoinette Jadaone rom-com opposite Enrique Gil in 2019, has never been secretive when it comes to her admiration for other celebrities and artists. On November 23, Liza replied to BTS member J-Hope's tweet, saying "I'm your hope, you're my hope." ICYMI, Liza's full name is Hope Elizabeth Soberano, so her saying that she's his Hope is a pretty big deal. It's peak fangirl 100 percent! Last year, Liza's tweets (which have since been deleted) regarding BTS went viral, but this time, it was in a not-so-positive light. In May 2017, after BTS performed in Manila for their Wings Tour concert, the actress wrote: "BTS as in behind the scenes?" to which BTS fans replied with memes and incredulous tweets because they thought Liza really didn't know who they were. Later, the actress tweeted: "People wouldn't know sarcasm if it slapped them right in the face."